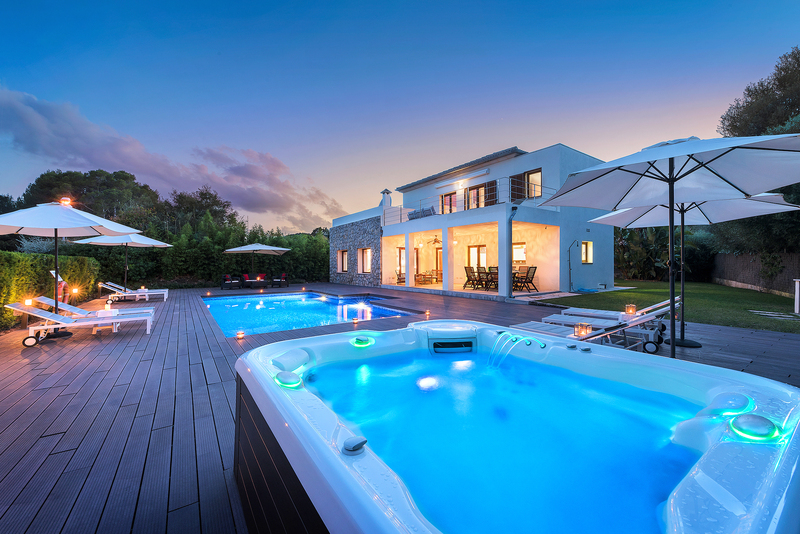 Luxury 4 Bedroom, 4 Bathroom Villa with Sea View and a Private Swimming Pool , Air Conditioning, WiFi, Satellite TV, near Golf, Sleeps a maximum of 8 people. 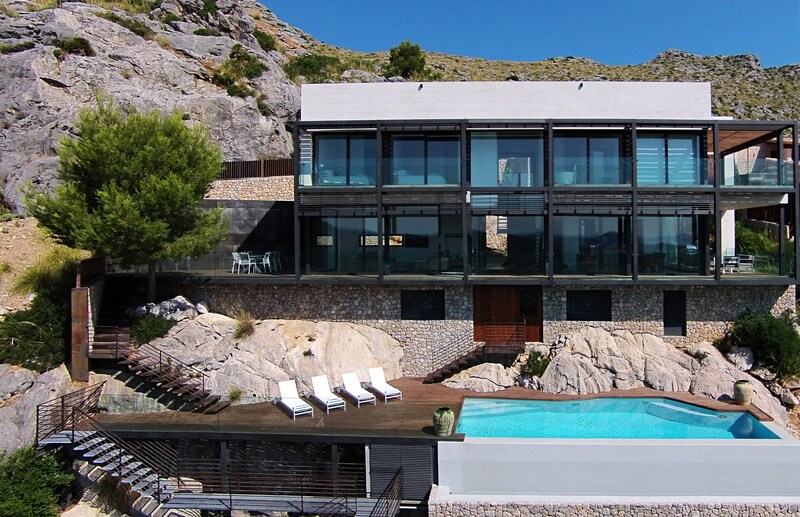 Casa Liebre is pretty easy to describe in just one word: “magnificent”. 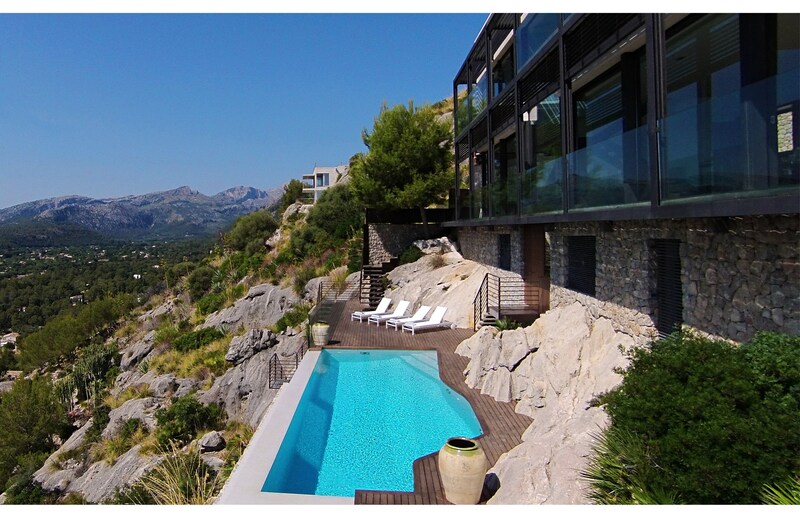 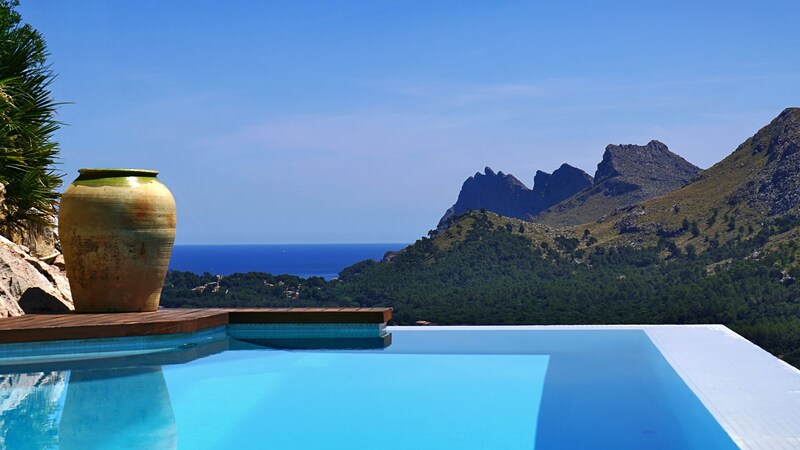 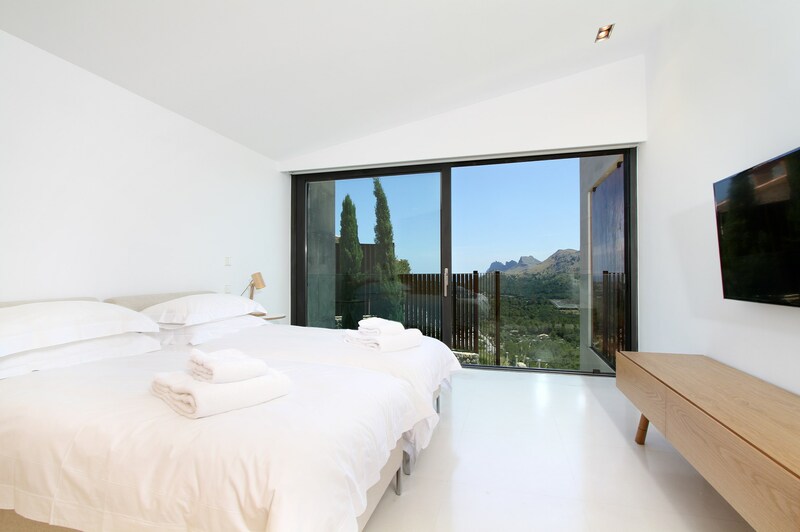 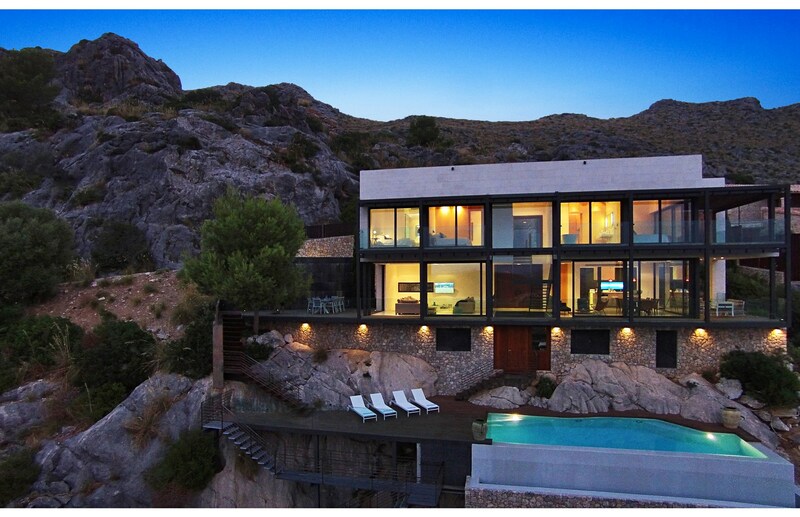 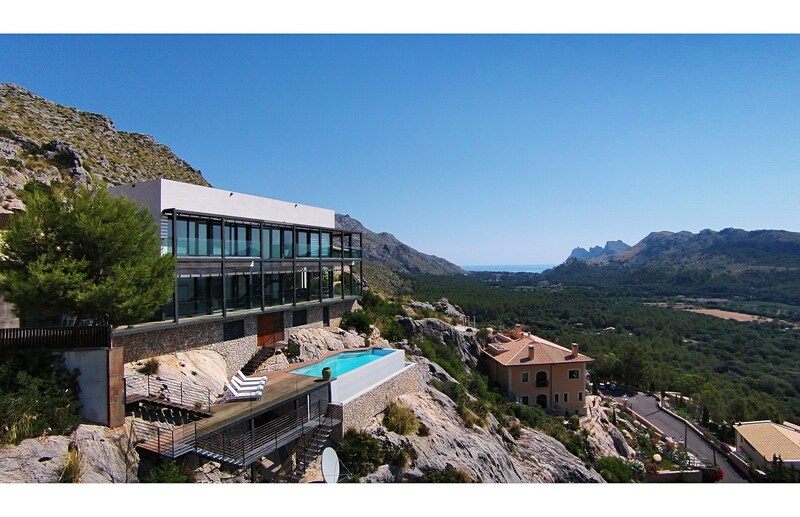 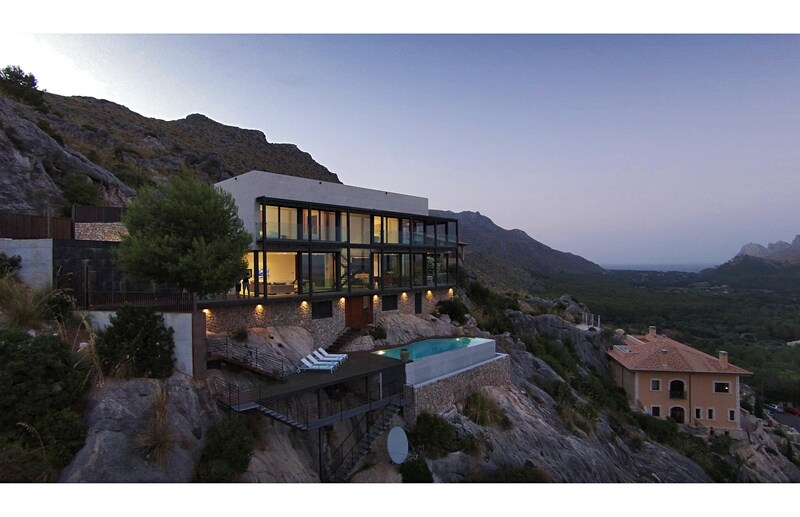 Built high into the hillside overlooking the deep blue Mediterranean Sea and the gorgeous Tramuntana Mountains, the views from this exceptional holiday villa are surely amongst the finest in the whole of Mallorca. 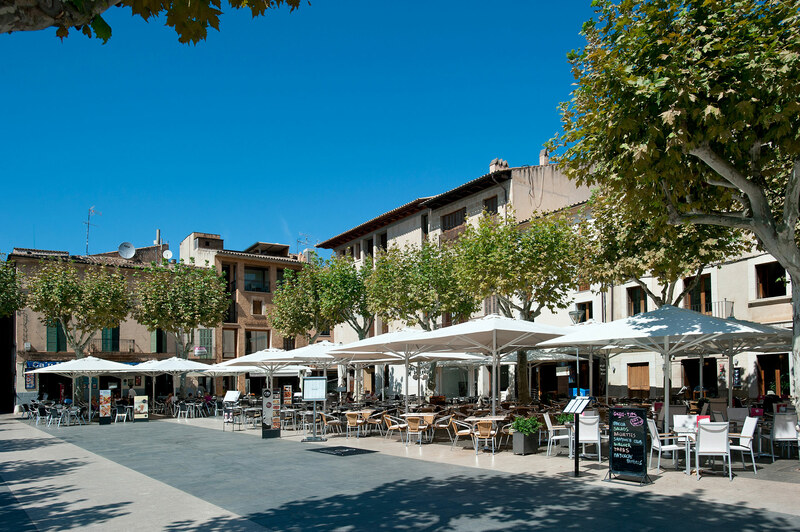 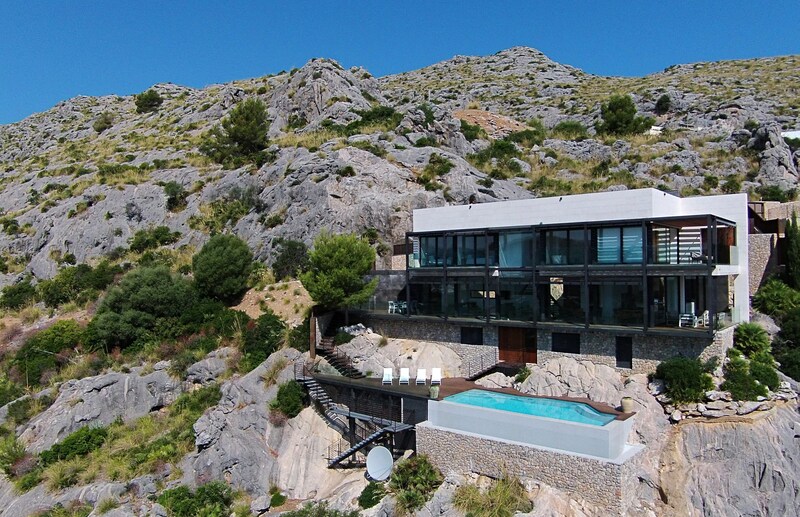 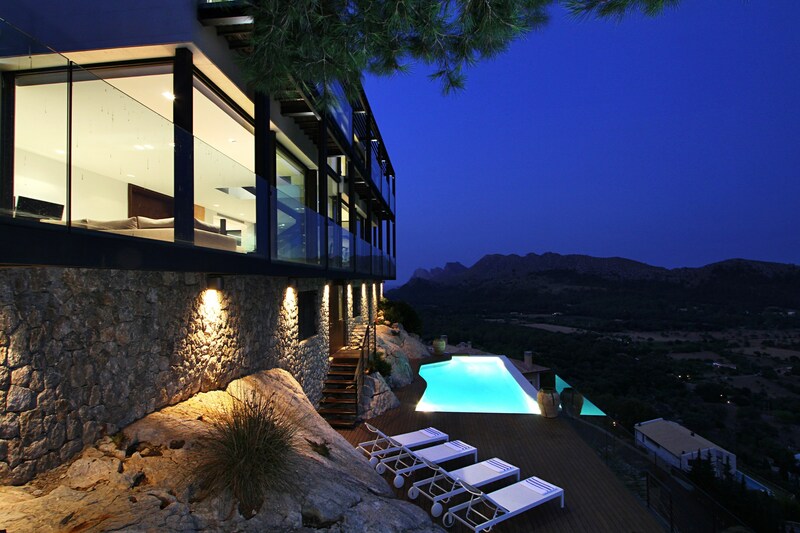 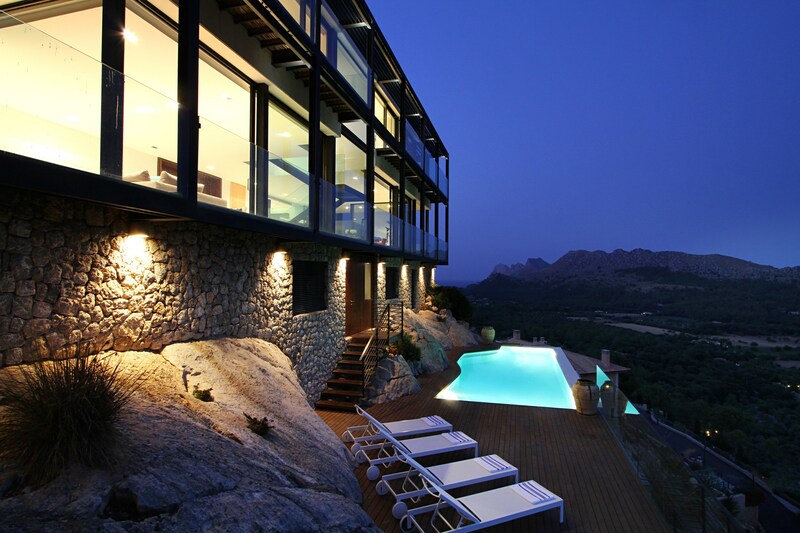 If you want live in luxury “like the folks on the hill” as part of your Mallorcan holiday, Casa Liebre is waiting for you. 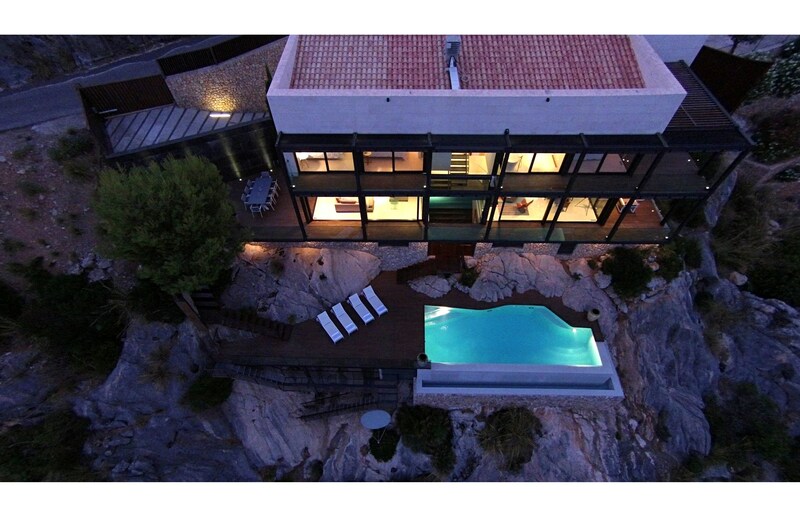 First of all the architecture. 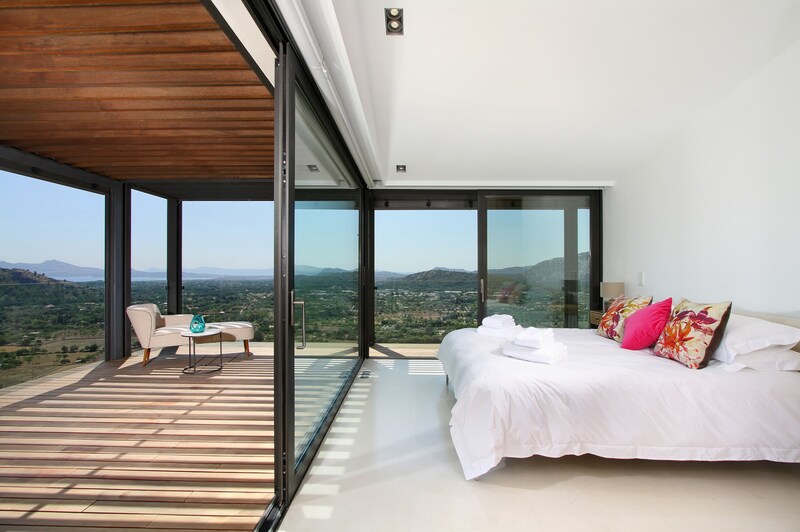 The design features of this extraordinary villa are all about cool, clean lines and light, bright, airy comfort. 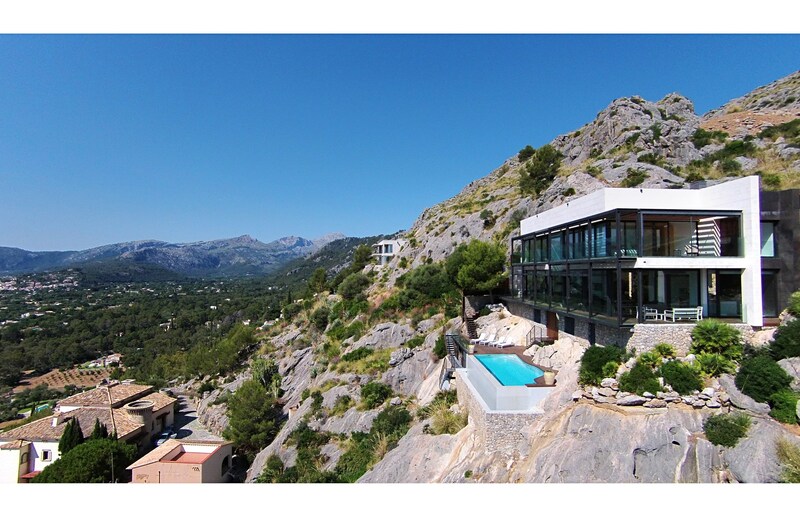 The property stands out head and shoulders above anything locally. 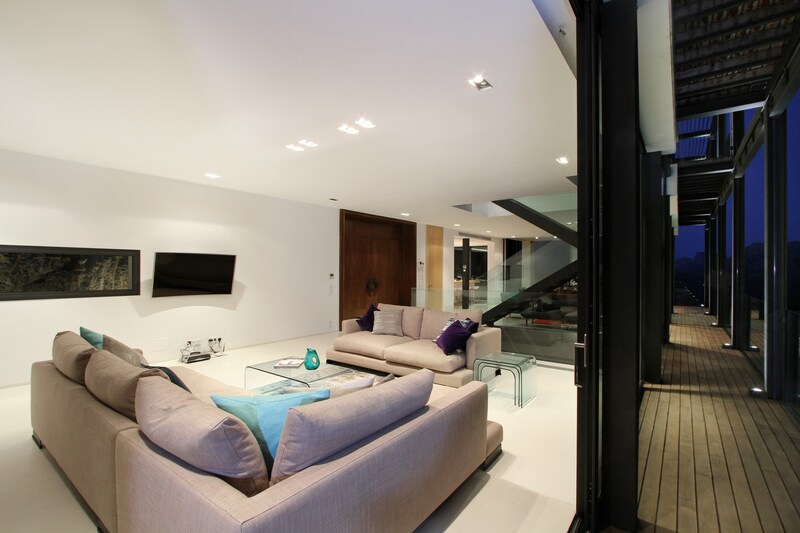 Imaginatively constructed using top quality materials, even the smallest details are carefully considered here. 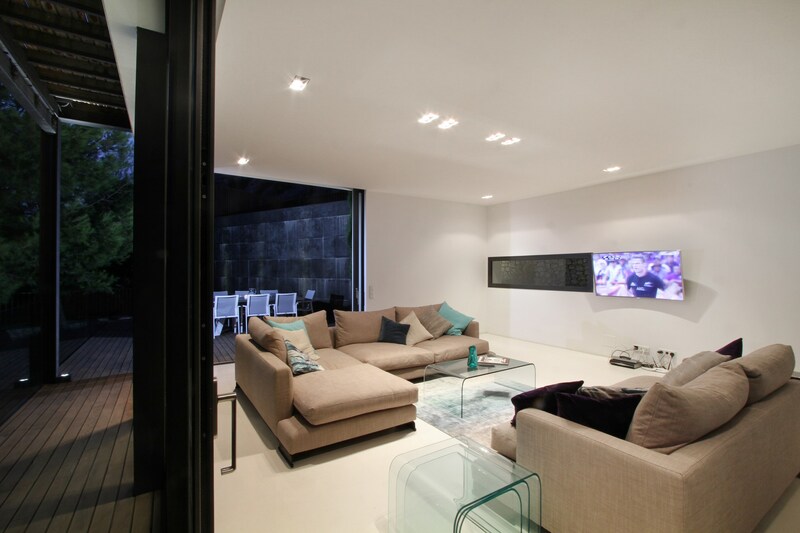 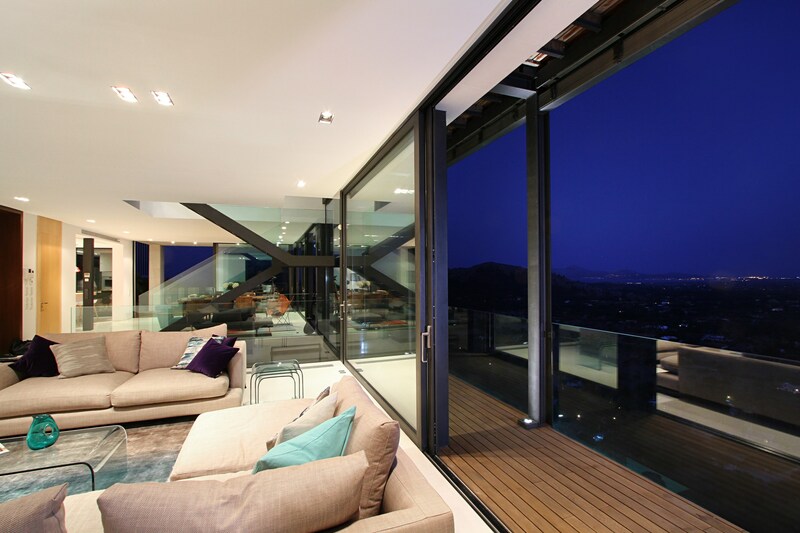 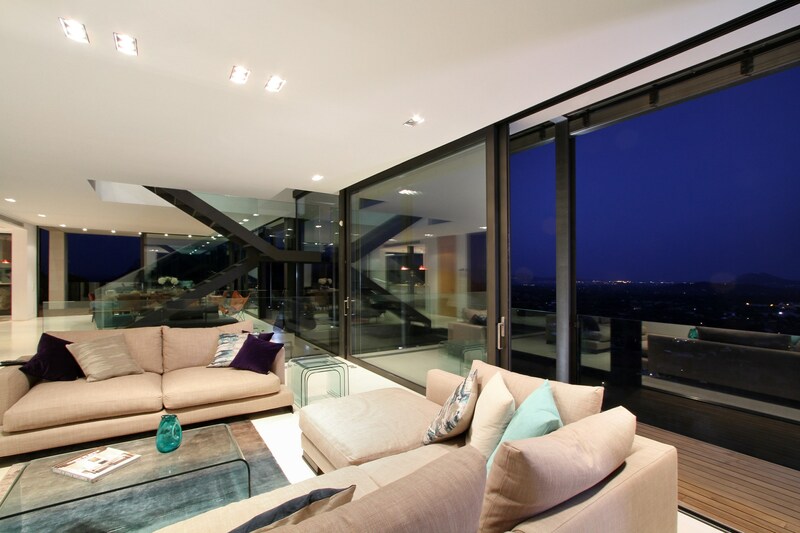 First of all, the huge windows are made from high tech Pilkington glass which excludes 98% of UV rays. 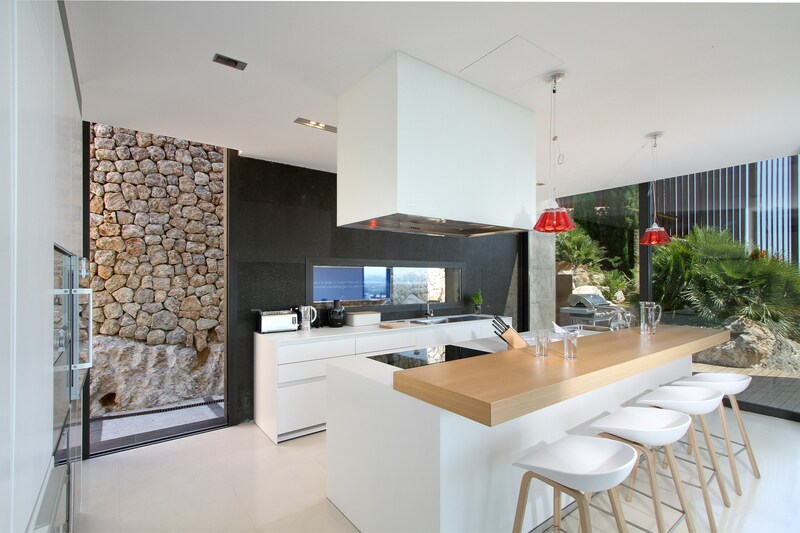 by Bulthaup, the appliances by Gaggenau. 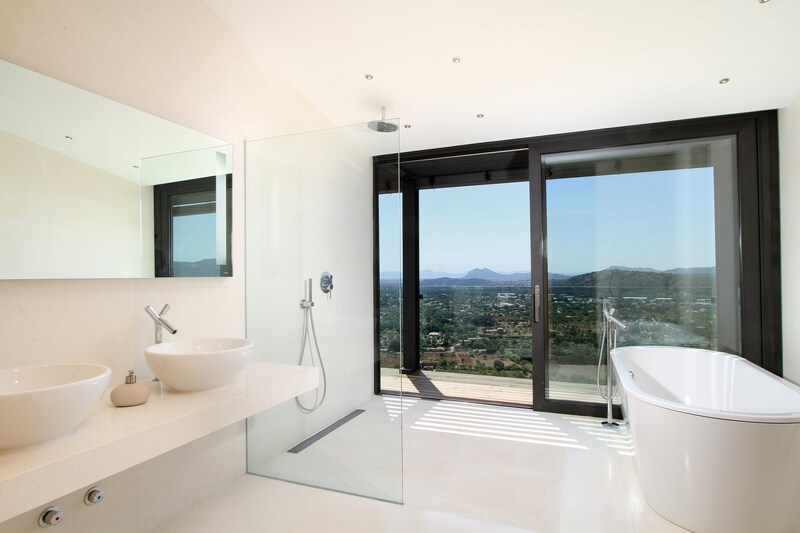 The washing machine and separate tumble dryer by Miele. 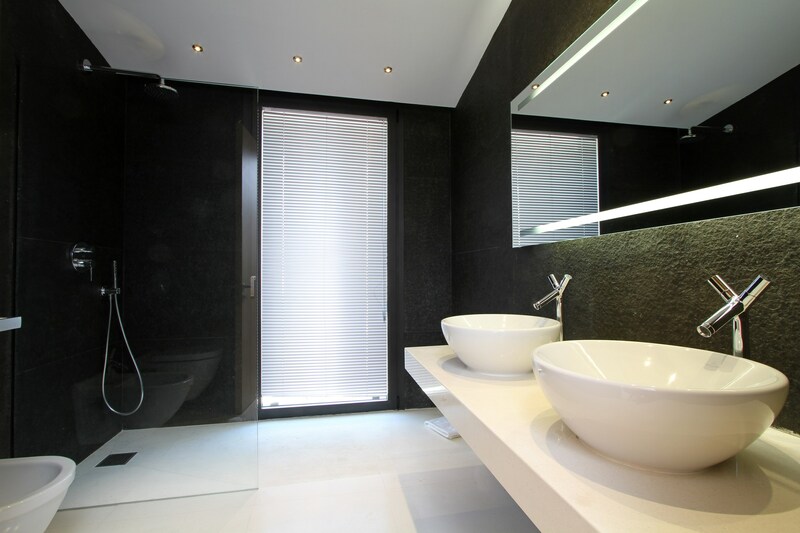 Sanitary ware comes courtesy of Villory & Bosch. 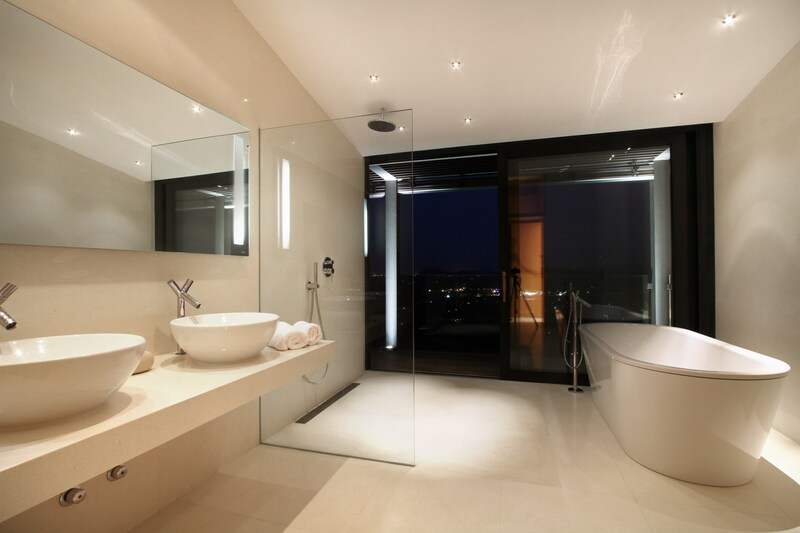 The taps are from Grohe. 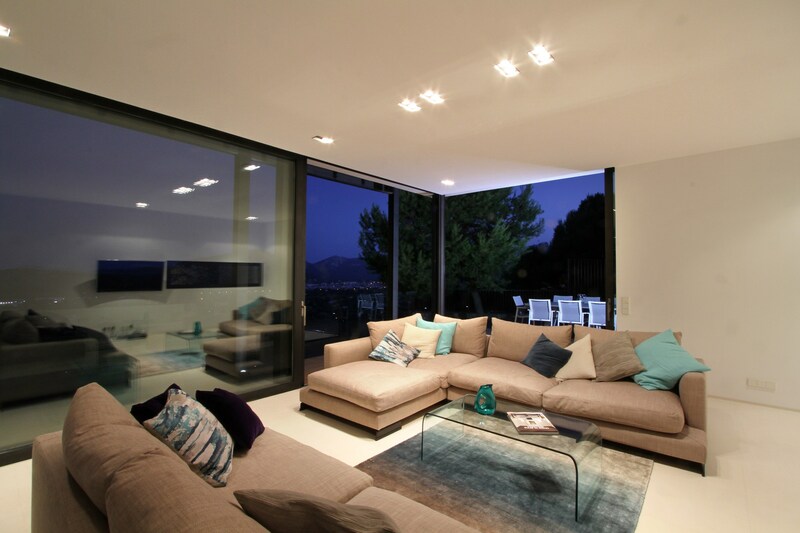 This is designer heaven! 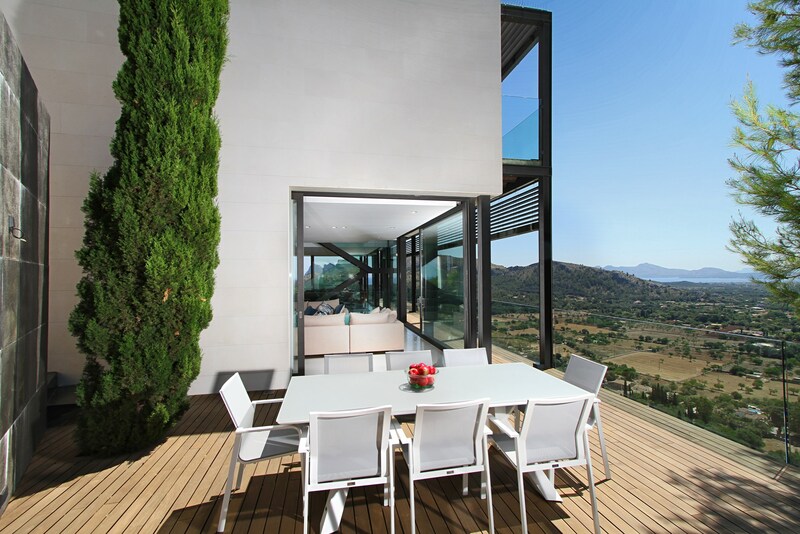 Everything is delightfully proportioned in a terrace-like structure at Casa Liebre. 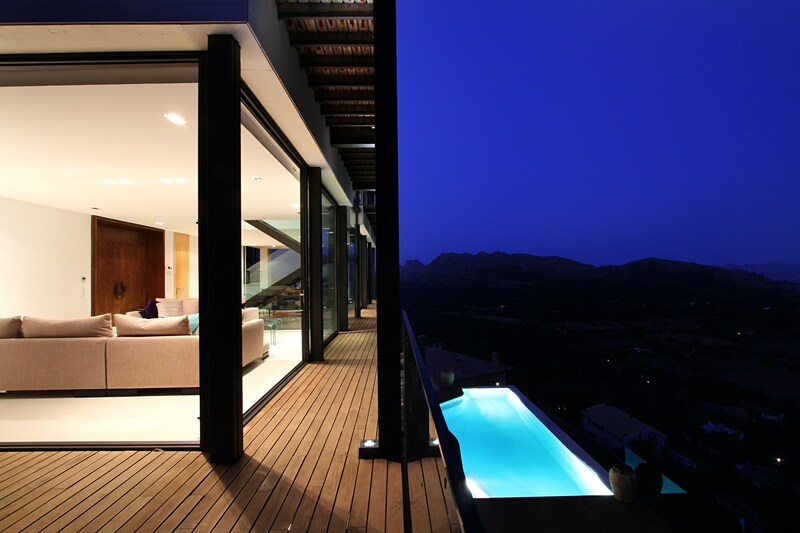 Starting from the lower level is your own private infinity pool featuring a swim counter-current jet. 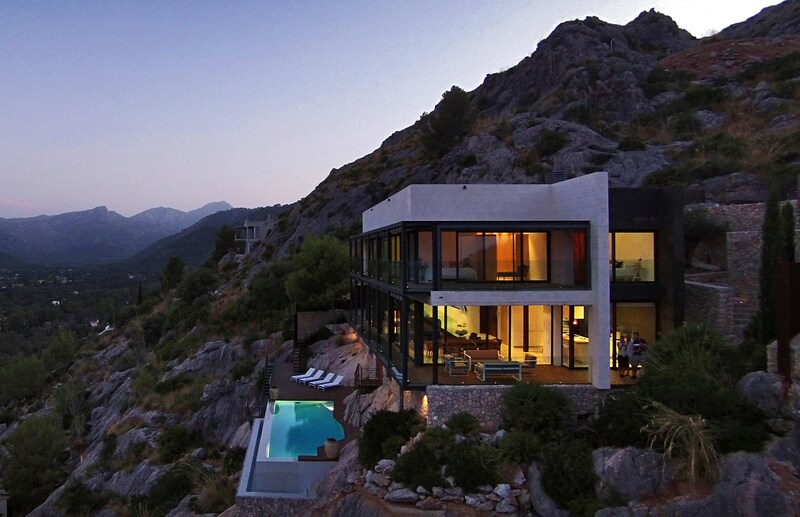 It’s almost like you are taking a dip in a beautiful pool high up in the mountains. 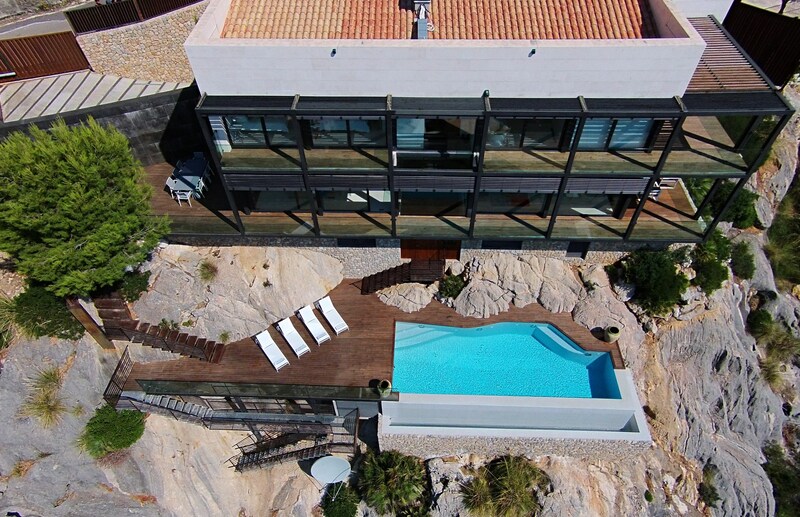 The pool (approx. 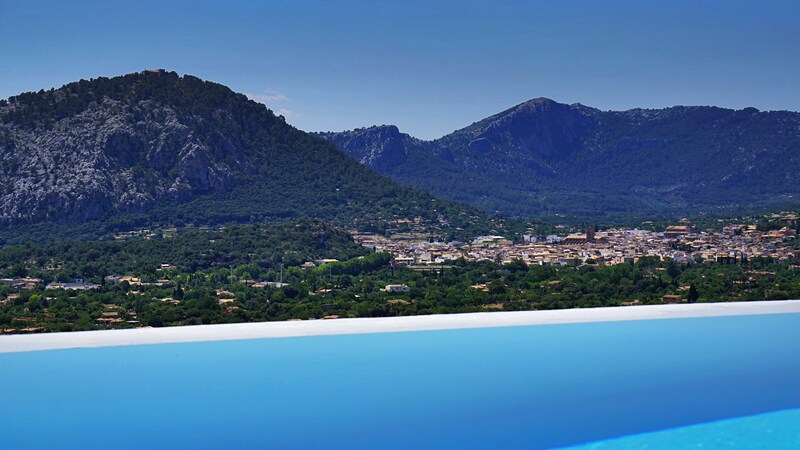 8m x 4m) is surrounded by exquisite wooden decking with plenty of sunbeds for relaxing on after a refreshing swim. 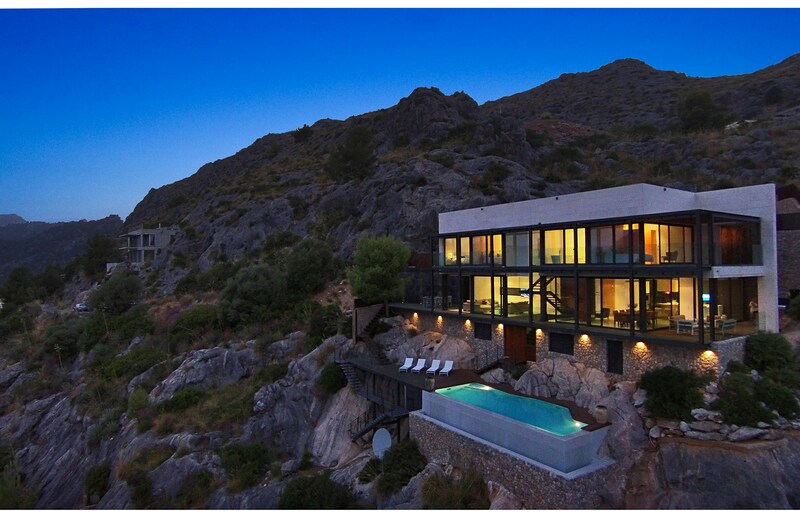 The surrounding rock garden compliments the elegant surroundings perfectly. 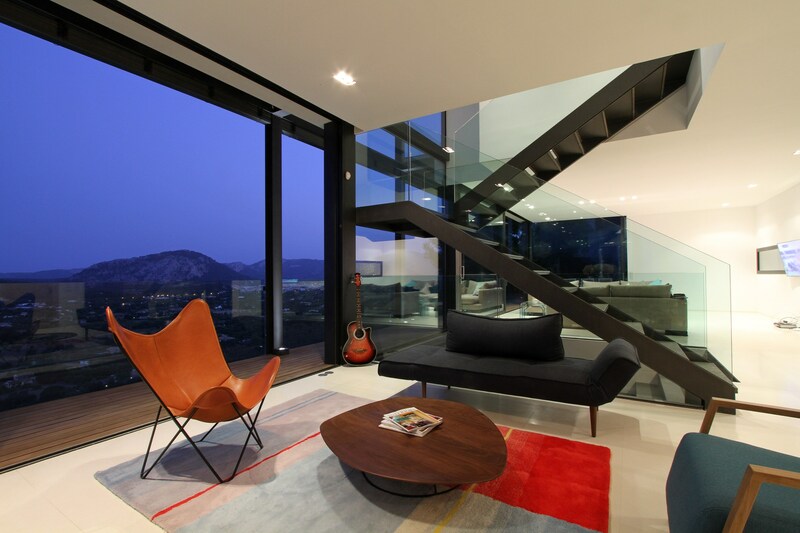 The ground floor is a dream. 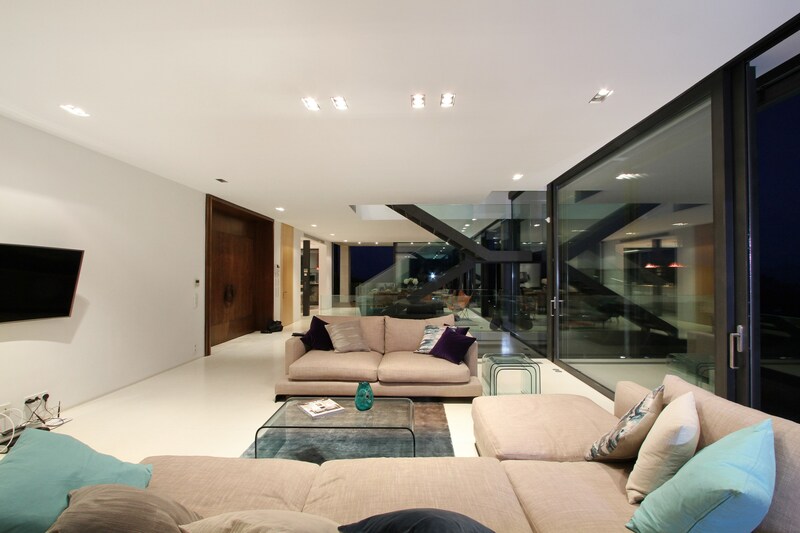 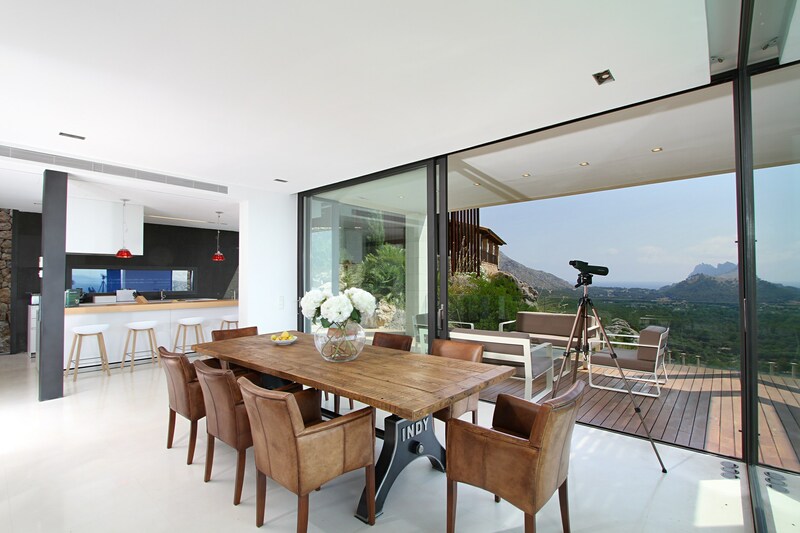 All open-plan with large windows allowing in the soft Mediterranean light. 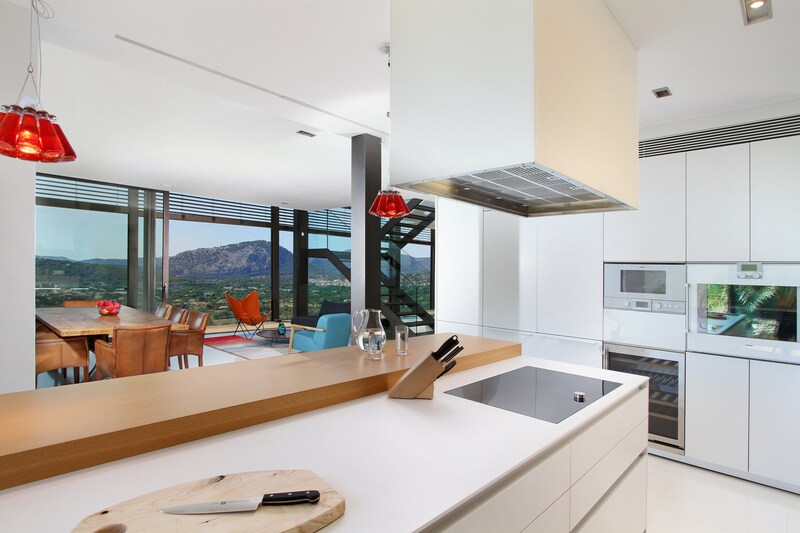 The gleaming white kitchen, in addition to the latest designer appliances, features a lovely breakfast bar where you can start the day in style. 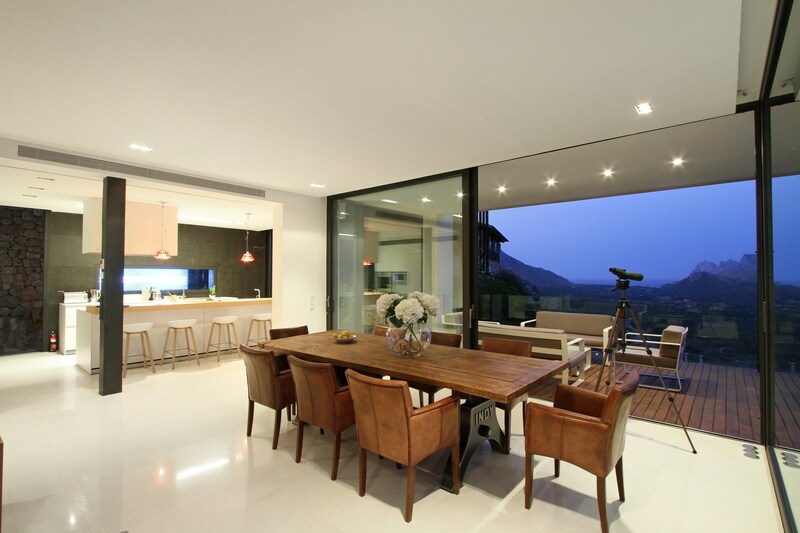 The dining area and lounge are spacious and stylish. 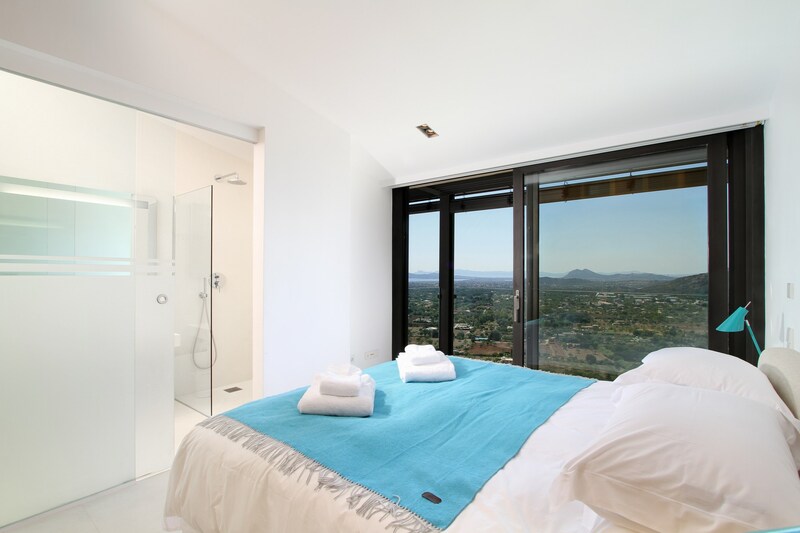 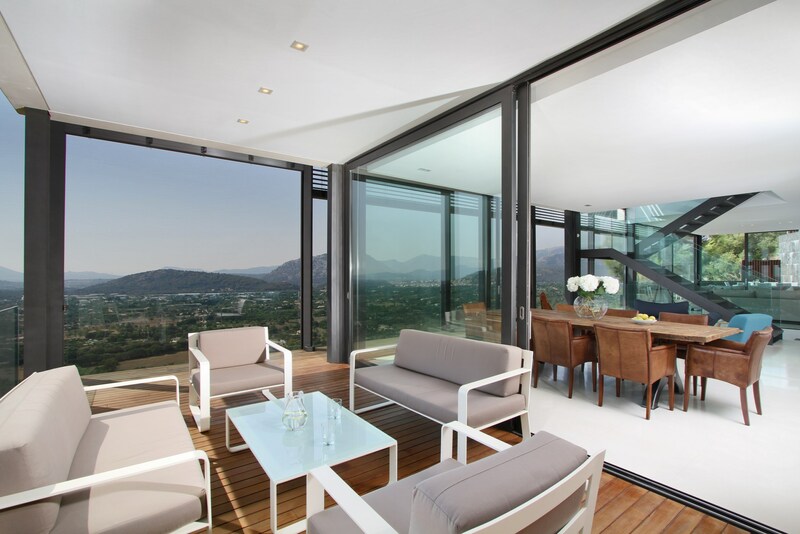 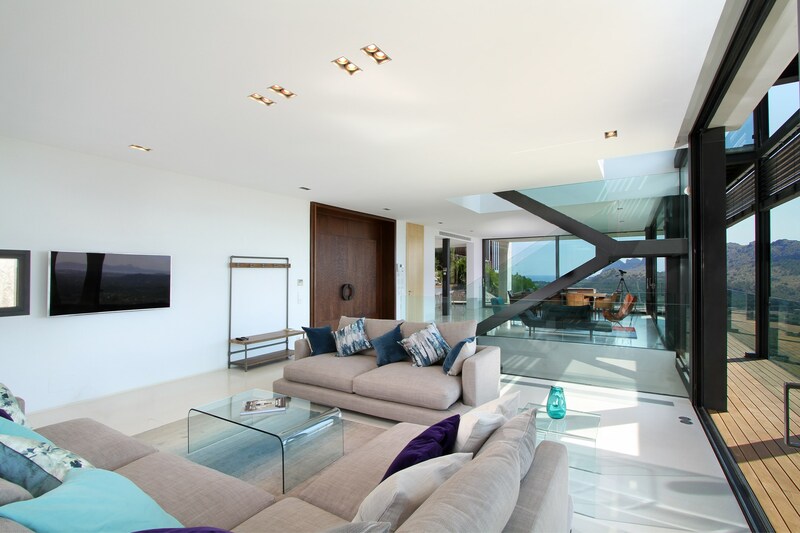 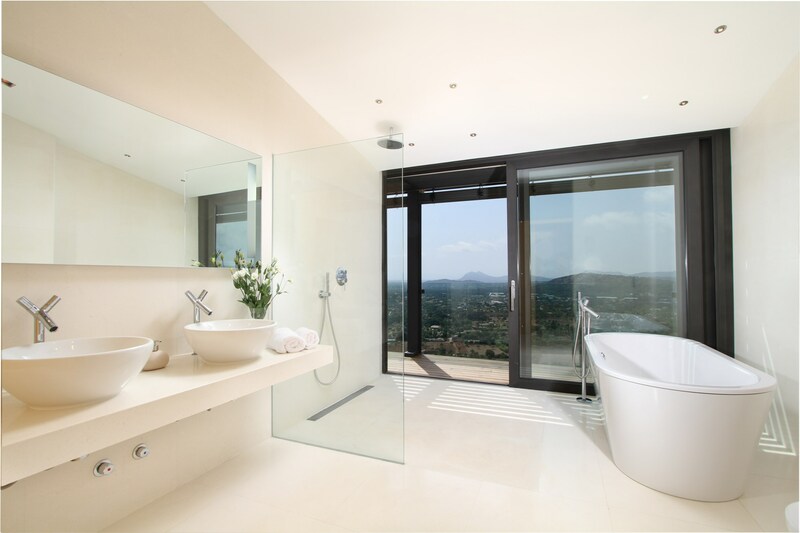 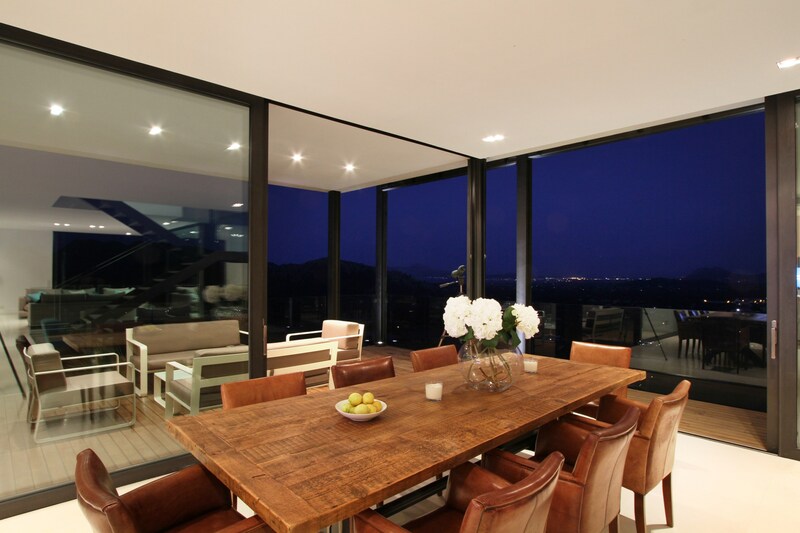 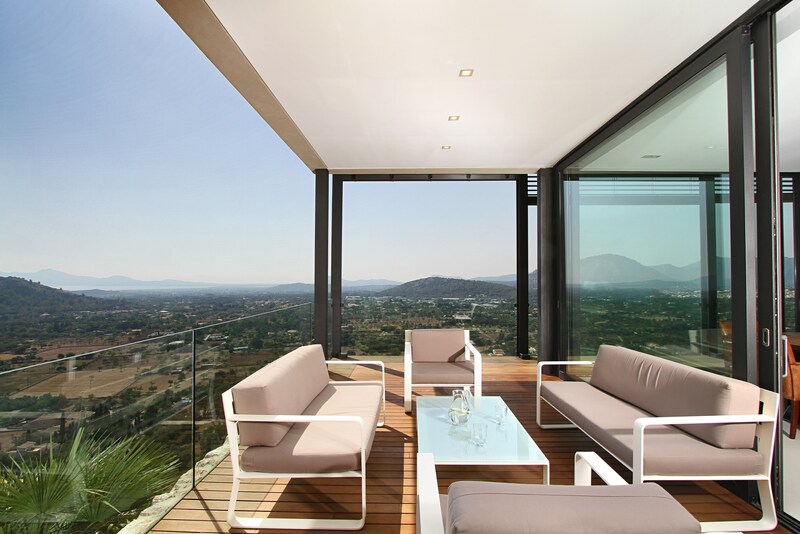 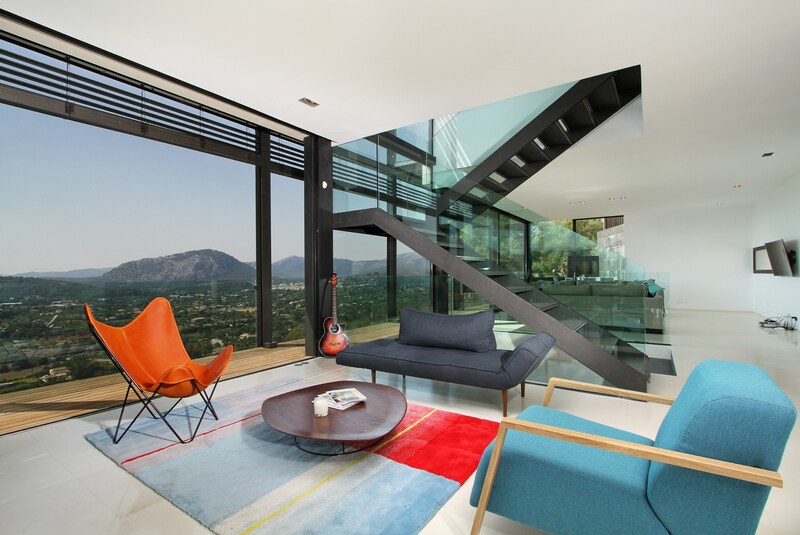 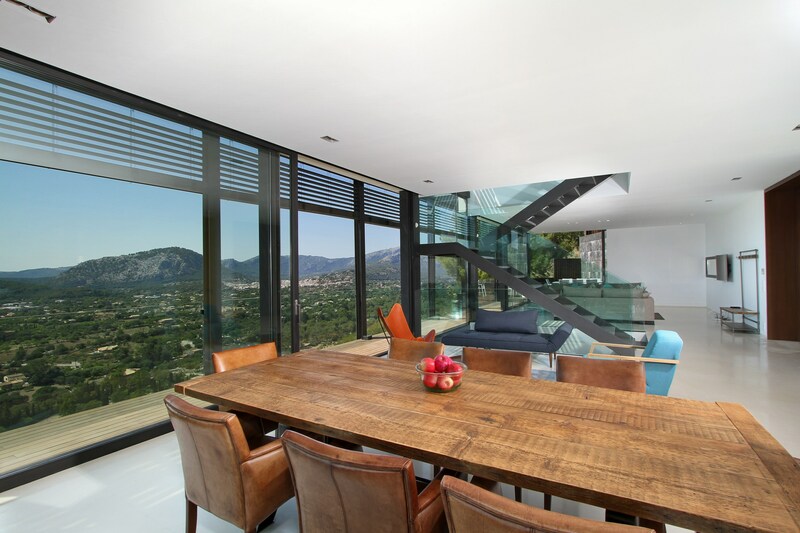 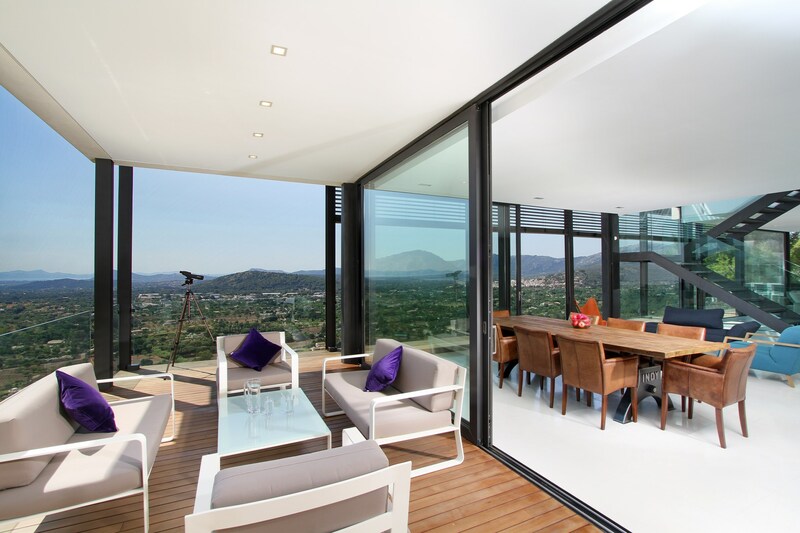 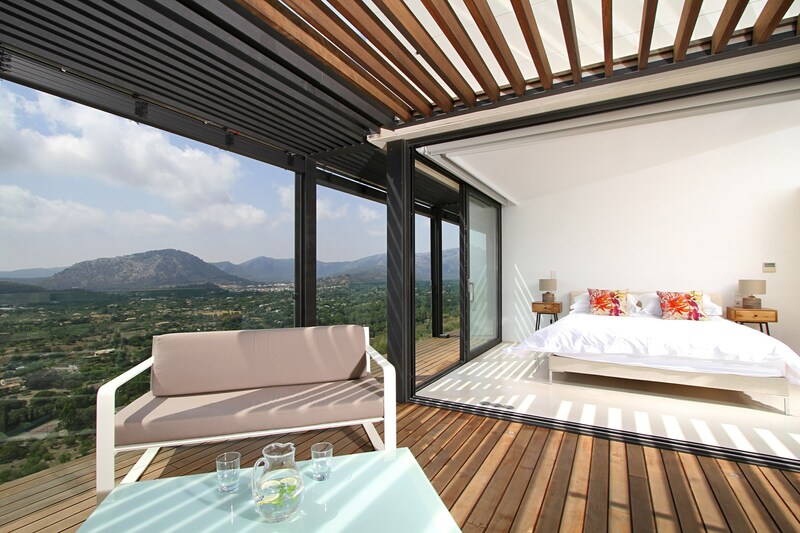 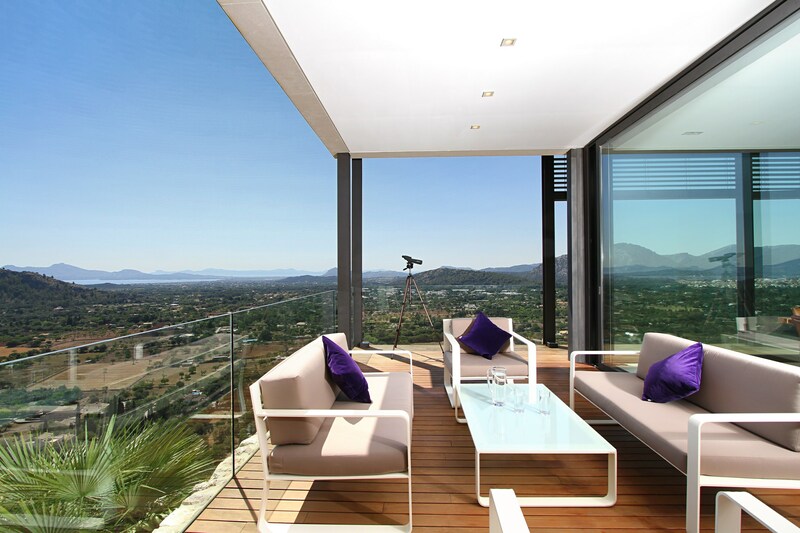 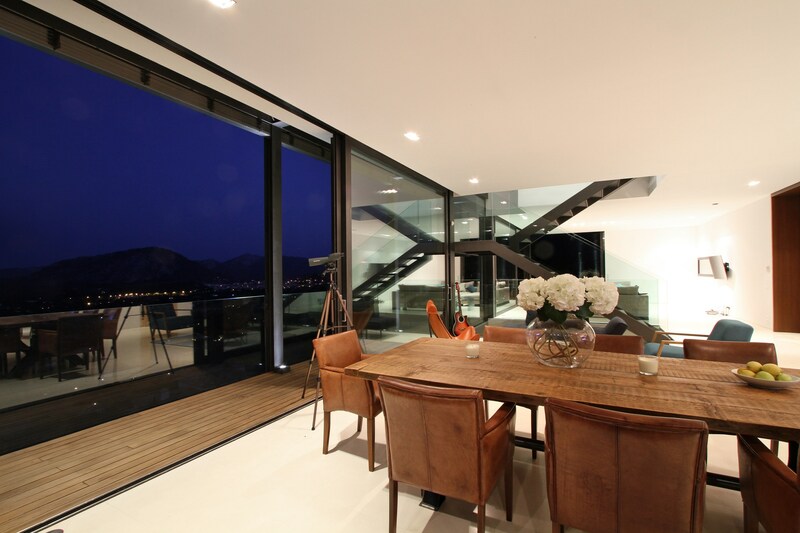 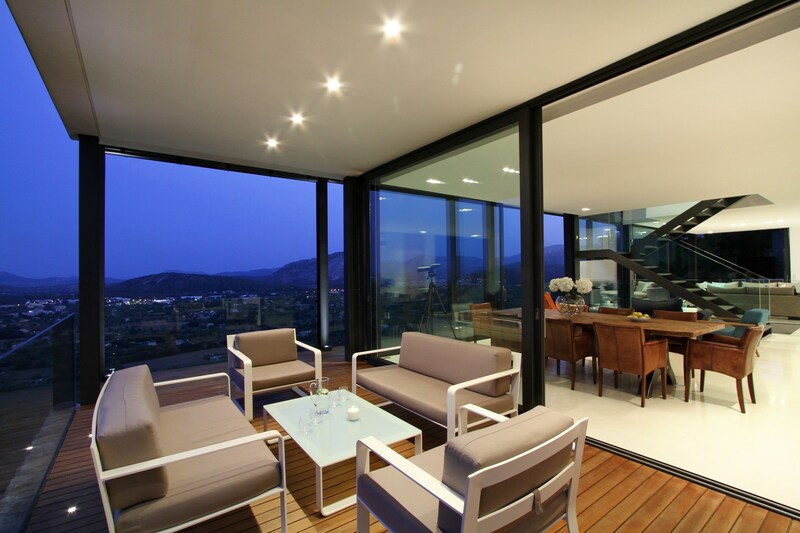 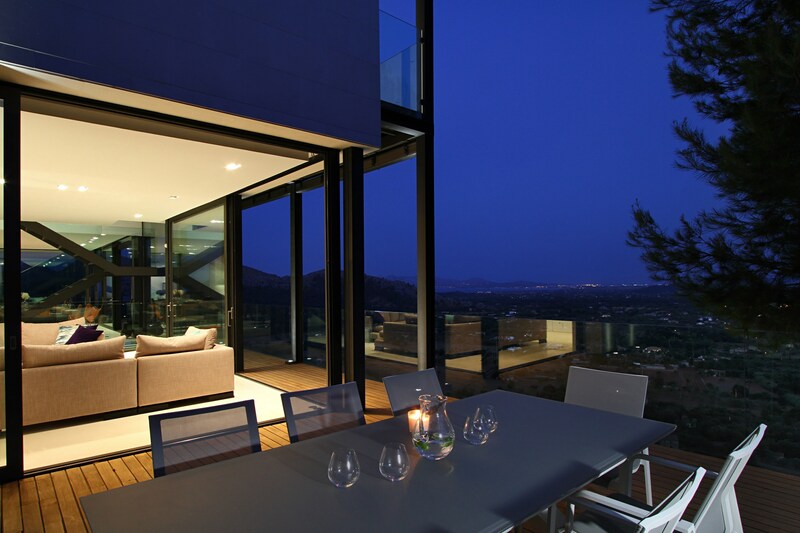 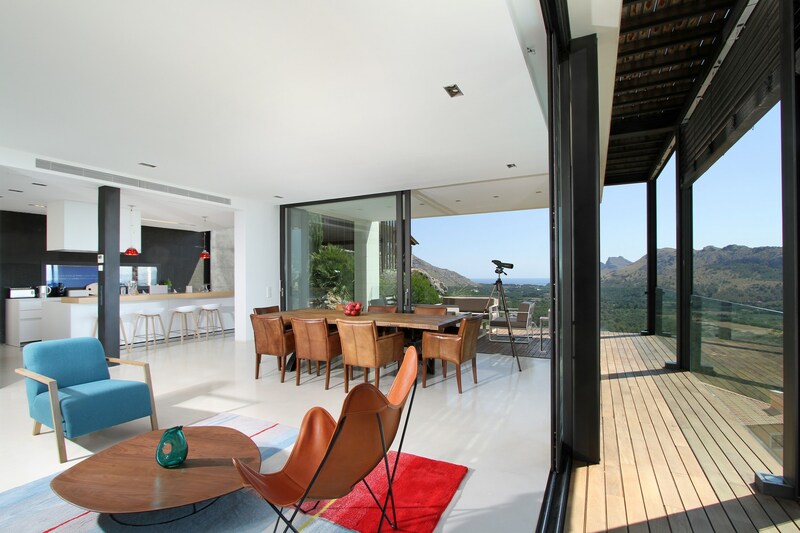 Beautiful bespoke contemporary furniture, and views to die for. 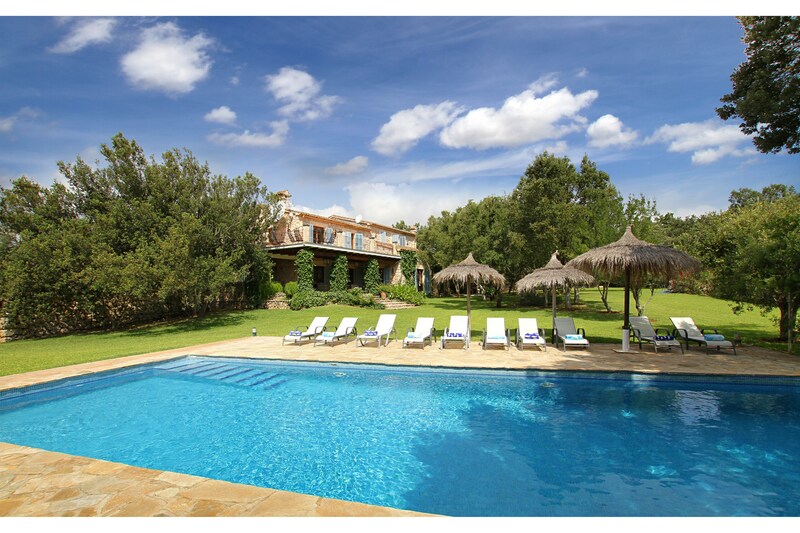 There’s a large flat-screen TV and a WiFi connection to enable you to keep in touch with family, friends and business colleagues. 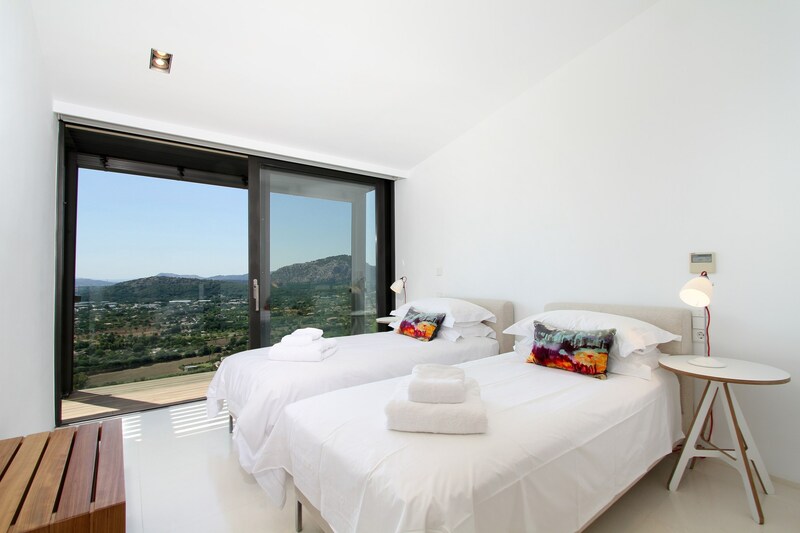 Two of the bedrooms are arranged as twins, there is a double bedroom and, of course, the amazing master suite with a double aspect balcony giving you an 180 deg. 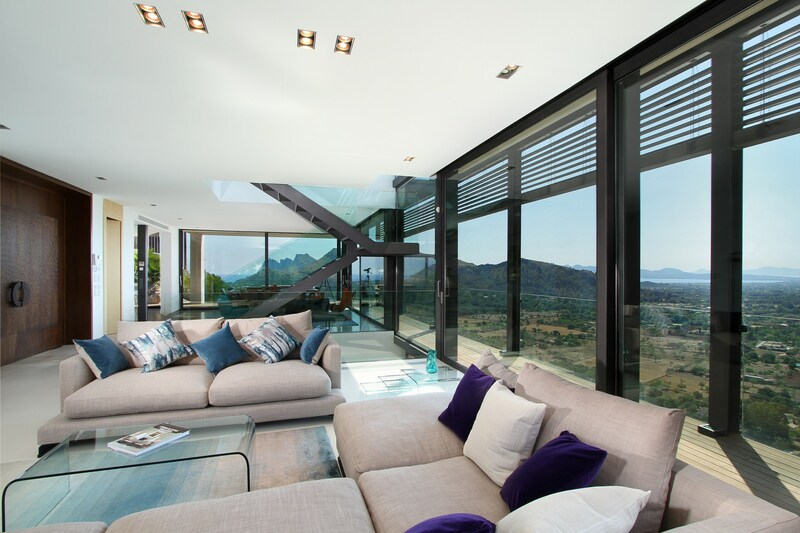 vista overlooking the mountains and the coast. 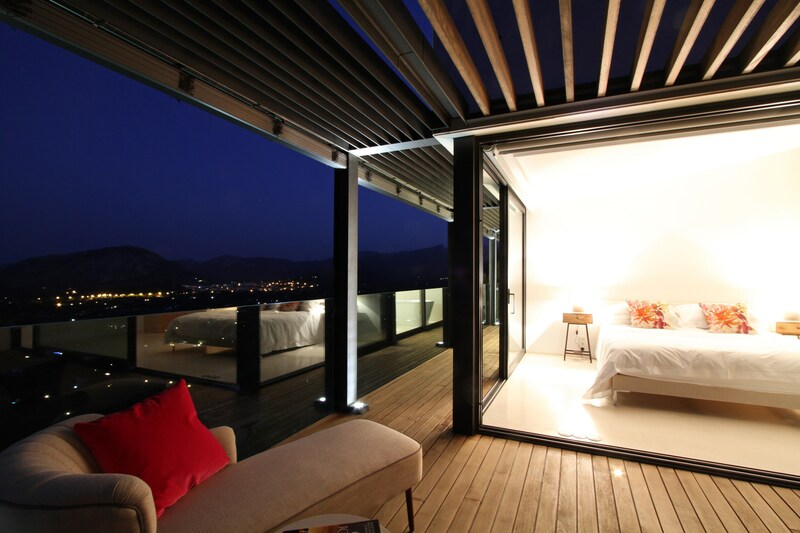 The double bedroom and one of the twin bedrooms also enjoy access to balconies. 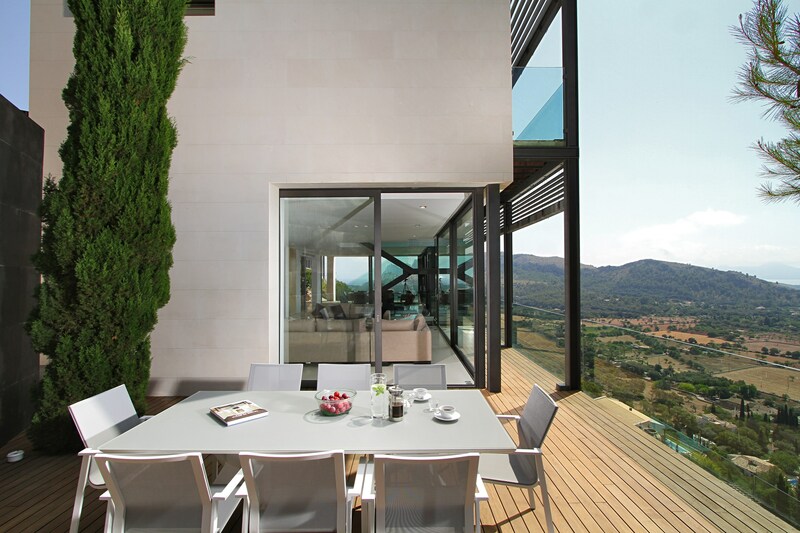 A rather unique touch here is the fact that exquisitely furnished terraces and balconies run right along Casa Liebre from end to end. 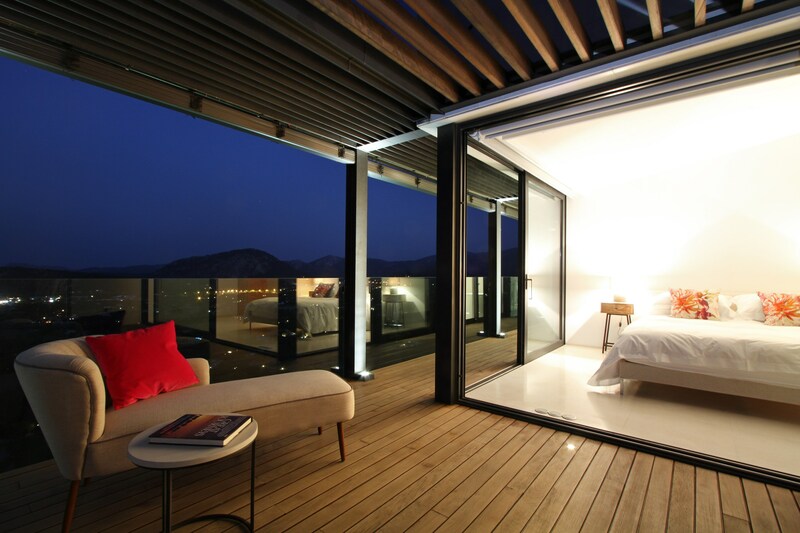 A chill-out area and solarium add to the property’s appeal. 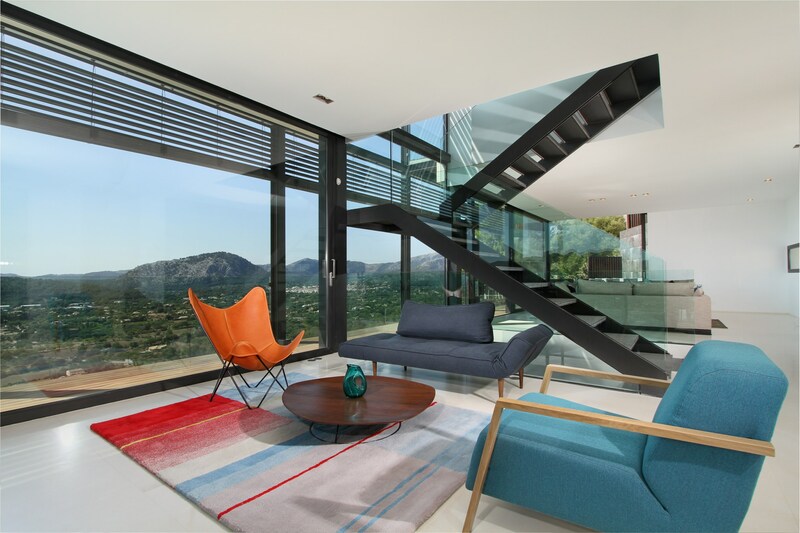 An entrancing glass-sided staircase leads you upstairs as well as down to a lower pool deck. 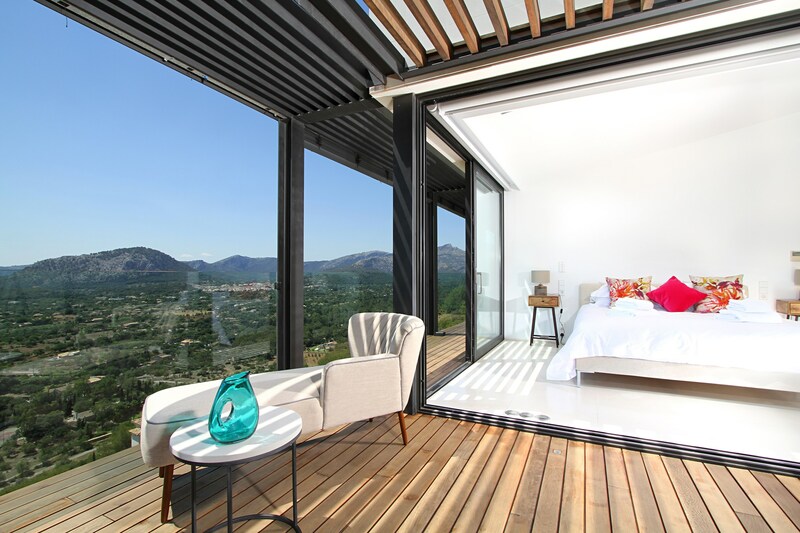 On the upper floor lie the four bedrooms, all with en suite bathrooms, walk-in showers, generous wardrobe space and electric blackout curtains. 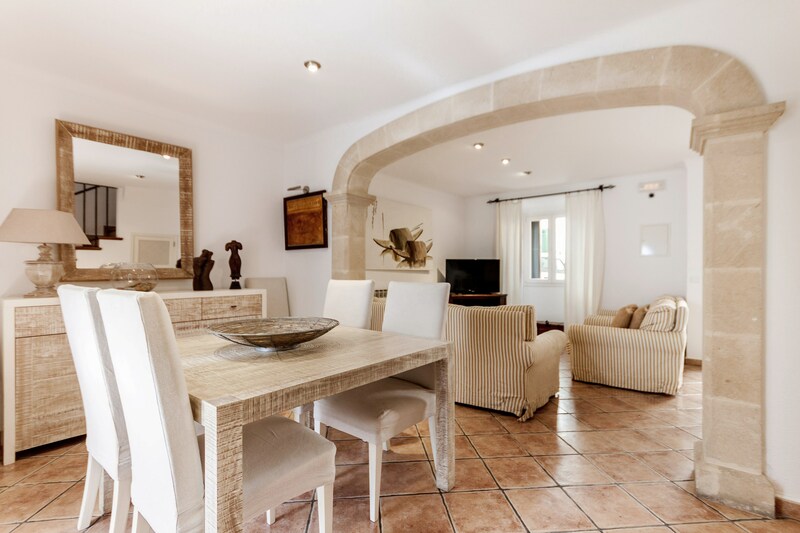 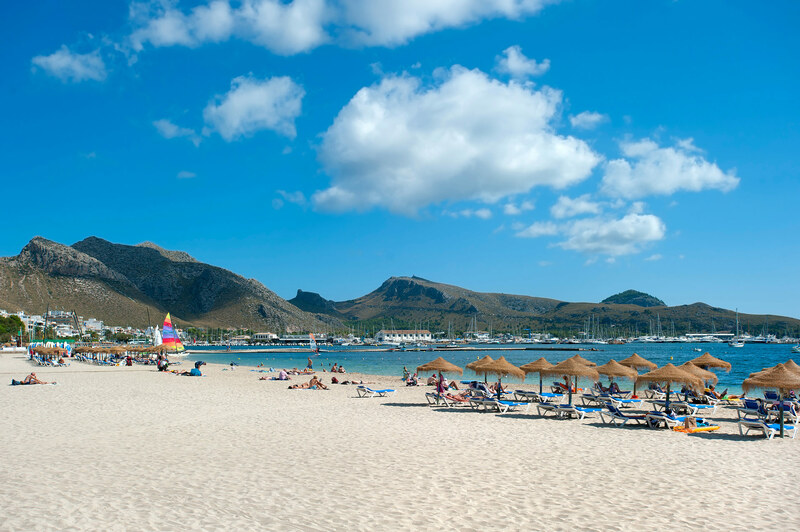 - this property is not particularly child friendly and the owners wish to stress that parents and guardians need to be extra vigilant of children under the age of 8 so that they do not hurt themselves. 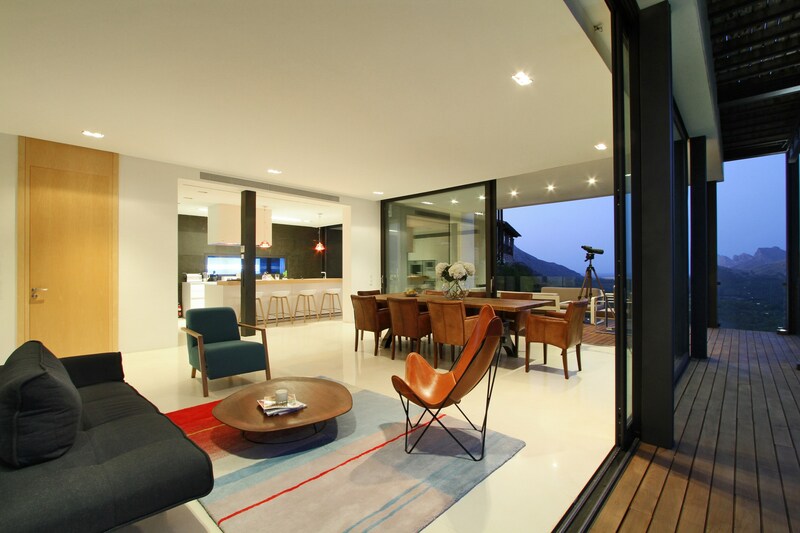 The owners are not liable for any accidents that happen due to client negligence.